What helps a woman to grown into her best true self? Is it the challenges? Is it the trials? Is it the triumphs? Or is it how she handles it all? In 20 Beautiful Women, Vol. 3, you'll read stories of women who, through dealing with life, learned about themselves and how they can best live and serve in their divine purposes. The stories in 20 Beautiful Women, Vol. 3, will sometimes make you laugh and other times make you cry, but you always will walk away inspired by their strength of mind and spirit. 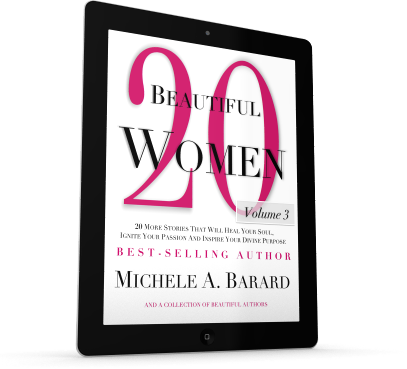 20 Beautiful Women: 20 More Stories That Will Heal Your Soul, Ignite Your Passion and Inspire Your Divine Purpose is a collection of personal short stories from 20 more authors, speakers, and life coaches bonding together for the common goal of sisterhood and to transform women from the inside out.